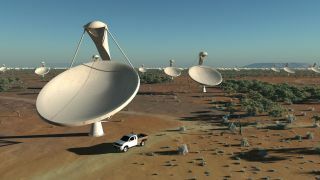 Artist's impression of the SKA dishes. Ben Gilliland, is a science writer and illustrator and the 2013 winner of the Sir Arthur Clarke Award for space media. He recently published "How to Build a Universe: From the Big Bang to the End of the Universe" (Sterling, 2015). Gilliland contributed this article to Space.com's Expert Voices: Op-Ed & Insights. Two years ago, after much procrastinating, I sat down at my iMac and started typing into a desperately blank document. Six months later, I had written and illustrated "How to Build a Universe" — a book that tells the story of how the universe came to be, how it evolved and how it will one day perish. Thanks to the glacial pace of the publishing world, it would be almost another year and a half before the book hit the shelves, so I started (quietly) praying that there wouldn't be any new universe-shattering discoveries made before the book made it into print. But I don't expect this situation to last. It is only a matter of time until at least a part of my efforts will be rendered obsolete by some new discovery, or paradigm-shifting revelation. By their very nature, all science books arrive on the shelves with a ticking time bomb of built-in obsolescence. So does it depress me that, at any moment, there might be an unanticipated discovery that would leave my book requiring an update, or even a rewrite? Of course not. The great joy of astronomy (and, indeed, science in general) is that some of the biggest discoveries — the real game changers that alter our perception of how the universe works — are those that we could never have anticipated in advance. For example, had I written "How to Build a Universe" two decades ago, I would have confidently predicted in the final chapter (well, as confidently as you can predict anything) that the cosmos would come to an end in something called the "Big Crunch." But the momentum gained from even the biggest explosion can only carry the shrapnel so far, and when it runs out, the shrapnel slows, gravity takes hold and everything falls back to Earth — a classic case of "what goes up, must come down." There was no reason to believe that the universe wouldn't follow the same rules, and as the momentum gained from the Big Bang ran out, its expansion would start to slow. Drawn together by the pull of their mutual gravitational attraction, the galaxies would one day start falling back toward each other — the universe would contract and eventually perish in a sort of reverse Big Bang, called the Big Crunch. But then, in the 1990s, some astronomers with no intention of discovering the fate of the cosmos accidentally redefined it. They were attempting to chart the locations of distant supernovae when they noticed something strange: The more distant the supernova, the faster it seemed to be receding. If the universe's expansion was slowing, you'd expect to see the opposite. So, instead of running out of momentum and slowing down, the expansion of the universe was actually accelerating. It soon became clear that some unseen force we couldn't directly see or detect was trumping gravity's attractive force and was actually pushing the universe apart — that something was dubbed dark energy. Most astronomers now believe that, far from ending with a big crunch, the cosmos will carry on expanding at an ever increasing rate until its energy is so thinly spread that it reaches a state of thermal death. Instead of falling back inward and ending in a dramatic Big Crunch, the universe will slowly freeze to death. If I'd written my book before 1998, I'd have had no reason to believe that the construction and ultimate fate of the universe would be redefined in such a fundamental way because no one was looking for it. But surely, in 2015, all the paradigm-shifting discoveries have been made, and aside from having to fill in a few vagaries (such as the not-so-small task of figuring out what dark matter and dark energy are made of), my book is safe? Er, probably not. This graphic illustration by Ben Gilliland explains how a solar system forms out of a nebula. There can be little doubt that new discoveries will be made that we couldn't possibly predict at this time, and some of what I have written about will have to change. Some of those discoveries will be deliberate — specifically targeted at defined mysteries — while others will emerge unbidden from research targeted at something else entirely. One source of targeted discovery is likely to be the Large Hadron Collider (LHC). When the LHC is switched back on later this year, it will be able to unleash twice the particle-smashing power it had when it teased the Higgs boson into revealing its identity. With the Higgs under its belt, the upgraded LHC's attentions will be turned toward probing some of the unseen matter thought to make up the universe. In my book, I describe the particles of the so-called Standard Model from which the galaxies, stars, planets and you and I are constructed. But we know that this sort of everyday "visible" matter makes up just a tiny percentage of the total mass of the cosmos — the vast majority of the universe is made from dark matter (an unidentified form of matter that is only detectable through the gravitational effect it has on the matter we can see) and dark energy. The LHC will seek to uncover the identity of some of this missing matter. Its extraordinary detectors will sift through the debris thrown out by countless proton-destroying collisions in the hope that something new will briefly flash into existence. One of the things some scientists hope will emerge from the energy maelstrom is evidence of something called supersymmetry. Supersymmetry predicts that for every particle of the Standard Model we can see (quarks, protons, electrons, photons, etc.) there exists a hidden "super" particle — a super-secret, super alter-ego, which possesses similar properties to its Standard Model equivalent but has much more mass. If they are proven to exist, these hidden particles might account for some of the universe's missing "dark" mass. The LHC will probe the nature of dark matter more directly by looking for it indirectly. Because the LHC will be able to put so much more energy into its proton collisions, many more massive particles should be created (Einstein's famous equation, E=mc2, revealed that matter and energy are just two sides of the same coin). There is a chance that one of those massive particles will be a dark matter particle, and because dark matter is invisible, scientists will be able to infer its creation from the energy it takes with it (if significant energy suddenly vanishes from sight, it might have turned into dark matter). Of course, none of this would undermine the core story of my book, and unless something unexpected pops up in one of those collisions, any discoveries the LHC makes will just mean I can add some extra detail to the story I have already told. By keeping tabs on 1 billion stars over its five-year mission, Gaia aims to create the first accurate 3D map of the Milky Way Galaxy. See how ESA's Gaia star-mapping space telescope works in this Space.com infographic. The real game-changing discoveries are likely to arise from projects with less-targeted, wider goals — projects like the European Space Agency (ESA) Gaia spacecraft and the awesome Square Kilometer Array (SKA). These will map the cosmos in unprecedented detail — possibly revealing mechanisms that we haven't even thought to imagine — just as the discovery of the existence of dark energy came from mapping the positions of stars and the existence of dark matter was inferred by observing the motions of stars around galaxies. Gaia is one of the most ambitious space-charting missions ever conceived. From its position 1.5 million kilometers (934,000 miles) from Earth, Gaia is mapping the precise location, composition, brightness and age of a billion stars to create the ultimate three-dimensional map of our corner of the Milky Way. For a lucky 150 million of those stars, Gaia will also chart how they are moving through space. Their exact speed through the galactic medium will be measured as well as their motion relative to Earth — building a three-dimensional map that will allow astronomers to trace the origins and evolution of the Milky Way and even provide clues about its ultimate fate. As if this wasn't ambitious enough, Gaia's remarkable near-billion pixel camera will simultaneously map the locations of thousands of asteroids, comets, planetary systems, supernovae and even distant galaxies. Gaia is armed with two telescopes that will sweep the sky to a depth of 20,000 parsecs, or 65,200 light-years — generating so much data that the number-crunching power of a supercomputer will be necessary to process them. As impressive as Gaia is, nothing can compare to the ambitions of the Square Kilometer Array. The SKA will be the ultimate in universe-probing telescopes. Made up of hundreds of thousands of individual radio telescopes — built across South Africa, Australia and New Zealand — the SKA will have the resolving power equivalent to a telescope with a lens measuring 1 square kilometer. By the time it operates at full power in 2025, the SKA will make even the greatest of today's telescopes look like a child's plaything. For example, some 400 images taken over two years and requiring 10,000 hours of computer time are currently necessary to study the closest galaxy containing a supermassive black hole, Centaurus A, with existing radio telescopes. Using just a portion of the SKA, the same could be achieved with just two images and a mere five minutes of computer and observation time. Of course, the SKA won't just be randomly surveying the Cosmos — it does has some specific goals. It will put to the test Einstein's theory of general relativity, which describes how gravity is the result of mass distorting the space-time fabric of the universe. The two heavy-weights of the gravity world are black holes and pulsars. Put them both together and Einstein's theory will be tested to its limit. The SKA will be able to pinpoint regions where a pulsar is in orbit around a black hole and see whether this coming together of gravitational giants cause relativity to break down. The SKA is also expected to find an estimated billion previously unknown galaxies at the edges of the observable universe. By studying their movement and distribution, it is hoped the SKA will reveal the secrets of dark energy. It has even been claimed that, by observing the redshift of faint radio emissions from hydrogen gas over a period of 12 years, the SKA will be able to map the expansion of the universe in real time. To do this, it will have to be sensitive enough to detect the teeny tiny change in frequency (0.1 hertz, or less than 1 part in 14 billion) of the radiation emitted by hydrogen as it is stretched along with the expanding space-time fabric of the universe. In just a single day, the SKA will pump out enough raw data to beat the entire Internet's daily output tenfold, and just one week's data gathering will exceed the total of all the data that humans have managed to accumulate in our entire history. It's almost inconceivable that something new and unanticipated won't fall out of all that data. All of science is based on the foundations of ideas that came before — they build on each other, question each other; test each other; and, if an idea breaks, science seeks to replace it. If an idea doesn't break, it becomes a permanent foundation around which other ideas can be constructed, and so on, ad infinitum. That's the beauty of scientific theory. Even seemingly perfect theories are subjected to constant tests and observations — if parts are found wanting, they are refined and (if need be) replaced altogether. When you embark on a scientific journey, you know you are heading down a road that has no definable end. We aren't traveling toward a certain destination, or single revelation. The scientific journey is, by its very nature, one of discovery, and to discover anything, you have to take a moment to examine where you are now. Think of books like mine as a traveler's guide to where we are now, and we'll worry about the changes when we encounter them. Whether those are farther down the road, or just around the next corner, that's half the fun of it.